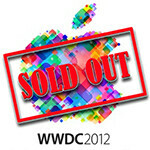 We all of you early risers got your WWDC tickets, as they’ve already sold out. We warned you this morning that these would be hot items, and it turns out that ticket sales were done in just under two hours from when they went on sale. That is significantly faster than last year's WWDC, which took a not-so-long 10 hours to completely sell out. Part of the difference may be that this year there is a growing expectation that a completely redesigned iPhone will make an appearance. Of course what would a developer conference sell-out be without some sort of red meat for Apple and Android fans? With apologies to the trolls out there, there just isn’t a meaningful way to compare the two this time around. Google’s I/O conference did sell out in less time (just under half an hour), but WWDC tickets cost almost twice as much ($1600 vs $900). Apple’s conference also lasts several days longer than I/O. Also unreported is how many tickets went on sale – if one of the conferences sold dramatically more tickets that would need to be taken into account before trying to assert you bragging rights. So in the end, let’s be satisfied with the fact that both developer conferences have legions of devoted attendees, and that neither Apple nor Google is pining away for more people to show an interest in developing for their platforms. wow... i'm sure you guys will be streaming the event right??? Does apple give you anything like Google does? Doesn't Google give people who attend a phone or device or something? It sold out because people are hoping to see a up front hands on iPhone 5, but the $1600 is crazy, but people spend whatever amount Apple tells them to anyway.
" people spend whatever amount Apple tells them to anyway" than why you and other blame Apple?.. is in it up to the people?.. Anybody who says Apple isn't behind the price hike is a complete moron. It just shows that Apple can change and charge whatever they want, and people will pay. A $700 price hike is just outrages and you would think people should be getting something out of it besides a peep show. people dont have to pay if they dont want to.. Michael Jordan can charge what he wants for his Jordans is stil my decision to pay as it is for the consumer.. is time people man up to their action and not blame anyone but them selves... the faster somethings solds out the more more expensive it will be next time. is common sense.. If Apple came out with the never before seen,revolutionary and magical iToilet Paper for $299.00 a roll those automatons would gladly pay it,then refuse to wipe themselves with anything else. That's how crazy it's gotten. C'mon man it's not that bad. Apple has their fans, google has theirs. I just happen to love em both. I'm a googapple fanboy lol. You want the new iPhone more then any other fandroid out there don't you? WWDC 2011 sold out in 2 hours as stated in the video of the event itself posted on Apple's website; about 2 minutes in. Please check your sources Scott.